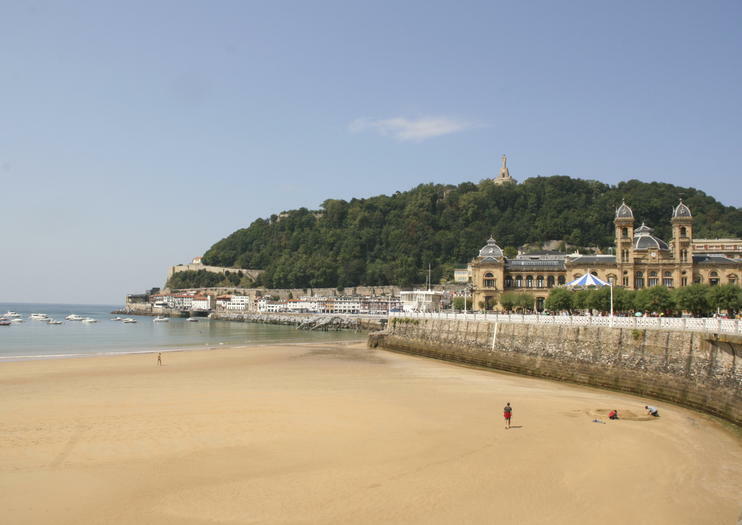 San Sebastian’s main crescent-shaped beach is of softest sand and punctuated at both ends by craggy hills: Monte Urgull to the east and Monte Igueldo to the west. Translating into English as ‘the shell’, La Concha was fundamental in the incarnation of San Sebastian as an elegant seaside resort favored by Spanish royalty back in the 19th century. The beach fills to bursting in the summer, when the bumpy waters of the Bay of Biscay are calm and pleasantly warm to swim in. Lifeguards are always on duty and there are showers and other facilities on the beach, making it safe and easy for families to enjoy a day on the sand. Two floating pontoons out in the bay are just the spot for sunbathing; beyond them the small, rocky islet of Santa Clara has a tiny beach that is a prime picnic spot and can be reached by motorboat or hired canoe. Now backed by formal gardens, a brightly painted carousel, and a row of charming hotels, seafood restaurants and bars, the Paseo Nuevo promenade that runs the length of La Concha comes alive during the nightly paseo, when San Sebastian residents and tourists alike dress up and go out on the town. Motorboats trundle back and forth to Santa Clara every half hour in the summer from El Muelle harbor at the east end of the beach. Canoes and pedalos can be hired by hour or by the day from a variety of venues along the beach. Enjoy a flexible itinerary and personalized attention on this private tour of San Sebastian and the Basque coast. Departing from Bilbao with a private guide, you and your private party will explore San Sebastian to taste some traditional pintxo (tapas), stroll on the beach, and explore the quaint city center. Along the Basque coast, make stops in Zumaia as well as in Getaria for a seafood lunch. Explore the best of northern Spain on this 4-day tour from Madrid. Visit the cities of Zaragoza, San Sebastián, Bilbao, Santander, Oviedo, Salamanca, and more during your adventure and learn about the history and culture of each place. See famous landmarks such as Concha Beach, the Guggenheim Museum, Mount Igueldo, a number of World Heritage Sites, and more. Admire the beautiful scenery as you explore these historic cities. Discover San Sebastian, the 2016 European Capital of Culture, on a private 4-hour walking tour tailor-made for you. Stroll along Concha Beach; visit landmarks such as San Sebastian Cathedral and María Cristina Bridge; and enjoy views along Spain’s Basque Coast. Enjoy a private city tour around San Sebastian’s historic center. Visit over 15 landmarks such as San Vicente Church and Plaza de la Constitución and learn about the history of each landmark from your informative guide. Finish the tour with a pintxo and a drink in one of the traditional bars of the old town. San Sebastian is one of the star attractions of Spain’s Basque Country and this full-day day tour from Bilbao takes in all the highlights. Enjoy a walking tour of the Old Town, stroll along the beautiful La Concha Beach, and take in the views from Igeldo Mountain. A 5-Day tour that runs through the Basque Country through its three provinces departing from Madrid. visiting wineries, sanctuaries, cities of important cultural life and small traditional villages. A mix of landscapes of green mountains and the coast of the Cantabrian Sea. Enjoy panoramic, and walking city tours on multiples cities through the itinerary and do not lose the change to visit the Guggenheim Museum with its permanent collection and temporary exhibitions. San Sebastián private guide with transport, maximum 4 persons. A full day customized tour with experienced private guide in and around the San Sebastián area. A highly customized tour where I design the perfect tour for smaller groups depending on their specific interests or needs. Private transport in air conditioned minivan included. Enjoy the beauty of San Sebastian on this private sailboat ride. Sail away from the hustle and bustle of the city and relax while enjoying beautiful views of the picturesque Campestre Sea and the San Sebastian skyline from a unique strategic position. Soak up the sun on the deck, enjoy a glass of txacoli and relax while the captain guides the sailboat along the picturesque coast of the Basque country. Looking for something a little out of the ordinary?For the early risers amongst you the Sunrise SUP trip is a very special time to be out in the bay, with perfect glassy conditions and nobody around. Paddle board as the sun comes up and see San Sebastian from the sea. La Concha is a famous, picture postcard, natural bay right in the heart of the city. It`s surrounded by two white-sand beaches overlooked by Santa Clara Island. We’ll will take you on a magical mystery tour, tailor-made to suit your level, stopping off for dips with a pit-stop on the island for breakfast.Its an incredible way to start the day.